With a break in the ARCA Series schedule Thomas “Moose” Praytor has been overseeing the installation of a new safety initiative at Mobile International Speedway. 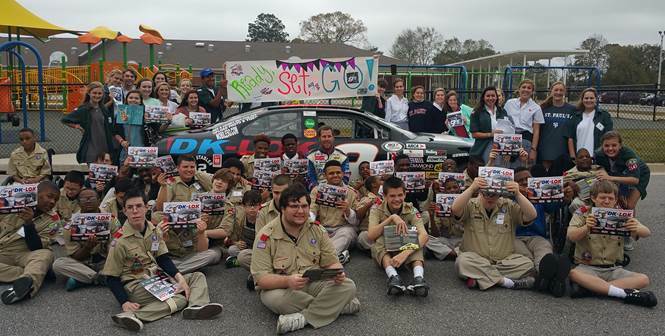 The hands on experience at the track coupled with 17 years of experience behind the wheel gave Praytor a unique perspective to talk Safety and Teamwork with a special group of Boy Scouts at Augusta Evans School. Augusta Evans is a school for special needs kids from K-12 grade that not only teaches basic education, but prepares them to get a job and be able to take care of themselves. The Boy Scout and Girl Scout Program are a big part of achieving those goals. Praytor and his Mobile based DK-LOK team have a few more weeks off before getting back to action in the Nashville ARCA 200 at the Fairgrounds Speedway on April 9th. Augusta Evans School: Augusta Evans School was organized to provide a quality education, appropriate for mentally handicapped students of Mobile County and individualized to meet each of these student’s needs. The faculty, staff and parents of Evans School are dedicated to insuring that every special needs individual receives an education of the highest quality, an education appropriately designed for each individual, an education which provides each individual with the skills necessary to become a productive citizen, and an education delivered in a setting designed to allow each student to develop to his maximum potential.The faculty and staff of Augusta Evans School take pride in its leadership role in Special Education in Mobile County. Realizing that continuing research and continuing preparation are necessary to facilitate change in any endeavor, the Evans professionals are dedicated to providing their educational expertise to the MR community in Mobile County.